Stoneground from whole grain this 100% rye flour is naturally low in gluten, producing close textured bread and cakes with a pleasing continental flavour. Rye flour is low in gluten and typically produces a slightly sticky bread dough and loaves with a close crumb structure and full bodied flavour. It is often combined with strong bread flour for lighter loaves. At Doves Farm we make biscuits, cookies and a large range of bread, cake and speciality flours. Rye grain has been cultivated at Doves Farm for many years and grows well on chalk and flint downlands. Traditionally farmers grew rye on land not suitable for wheat and occasionally planted wheat and rye together hoping one or the other would thrive. Rye flour is naturally high in gliadin but low in glutenin resulting in a lower gluten content than wheat flour thus producing characteristic, close textured, flavoursome bread and baked goods. 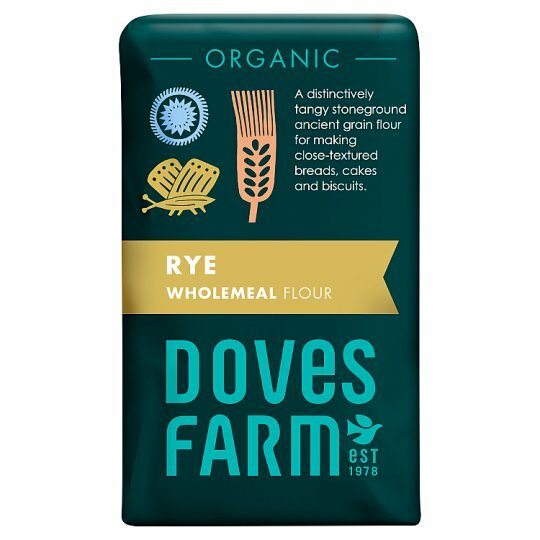 Doves Farm Foods was established in 1978, when we wanted to make flour from the organic wheat we grew. We bought a millstone and set it up in the barn on our farm on the picturesque Wiltshire/Berkshire border. We now have a thriving business which mills many different and rare grains. At the heart of our ethos, we are dedicated to ethical production methods, slow food and the organic movement. On our farm we rotate crops, livestock and grassland, as well as respecting the biodiversity of wildlife and the local environment. We have had Soil Association organic certification for over 30 years. We are also passionate about home baking and believe that what we eat today will affect our health and well-being tomorrow. Baking bread, cookies and cakes at home is a satisfying and rewarding activity. You can choose the best, local and seasonal ingredients, and know what goes into your family's food. To keep your flour at its best, roll down the top after use and store in a cool dry place., Best before: see top.